This Santorini travel blog is designed to help you plan a trip to Santorini, Greece. 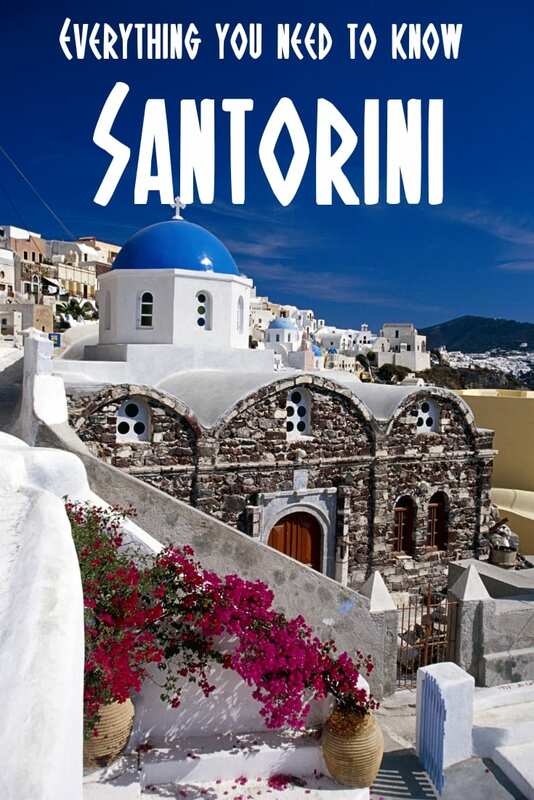 Includes the best things to do in Santorini, and where to see the Santorini sunset. 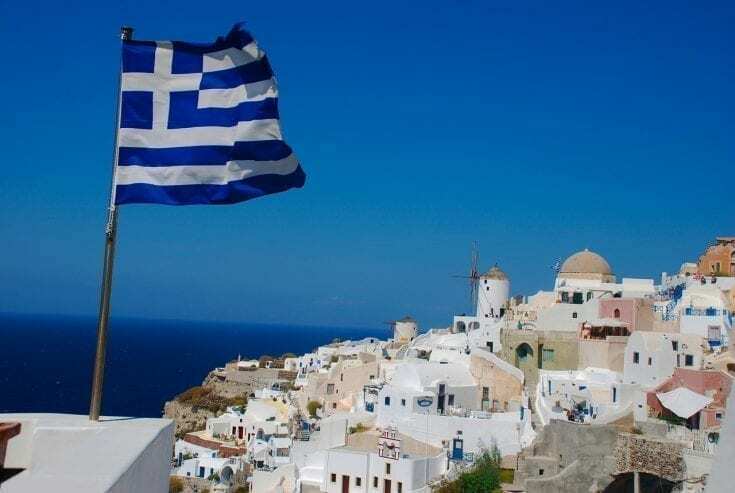 My name is Dave, and I've been living in and writing about Greece for several years. Over that time, I've created a number of Santorini travel guides to help independent minded people plan a trip to this beautiful Greek island. This Santorini travel blog page is the main hub from where you can find all the deep dive guides. Below, you'll find some quick links to my Santorini travel tips. Many travelers agree that the most beautiful of all the Greek islands is Santorini. With its colorful villages and notable sunsets, it truly is a must-see destination. 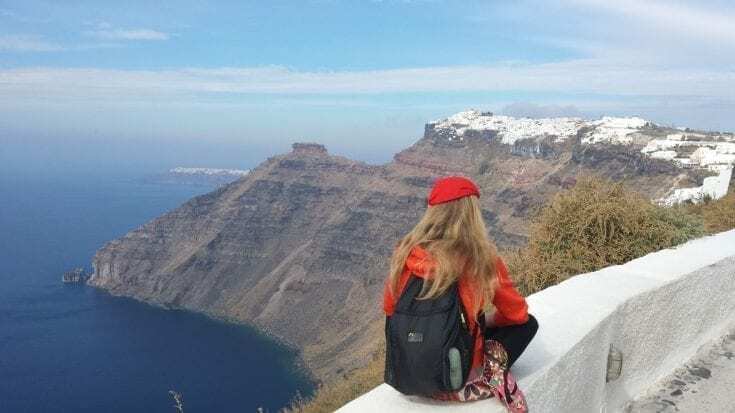 Let's take a look at some of the most notable facts about this island, things to see in Santorini, and how to get around. This is a commonly asked question, and most people are surprised to discover they need less time in Santorini than they think. In my opinion, 2 days in Santorini is enough to cover the main highlights of the island. 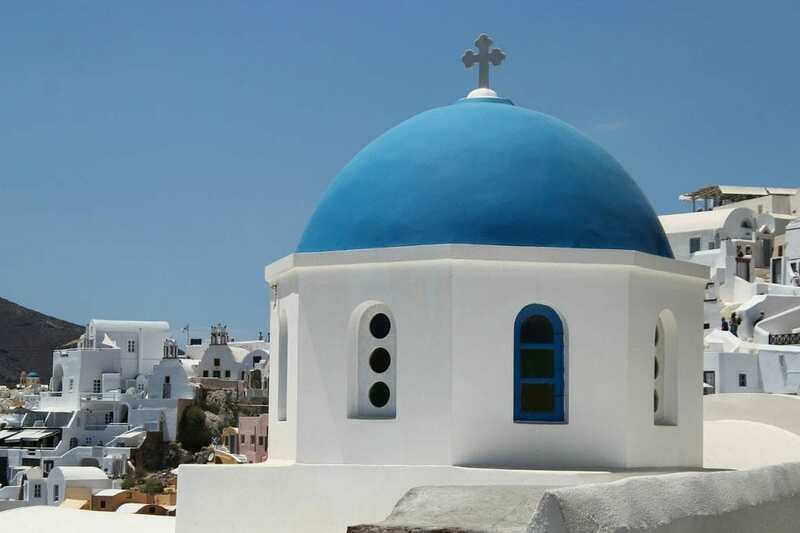 3 days in Santorini would provide the time needed to enjoy an additional day trip to nearby islands or other excursions. Santorini is a fairly small island, and with a total area of 29.42 miles (47.34 km), can be crossed from one end to the other in roughly forty minutes by car. Although the island is small, it is packed with beautiful towns and villages, the largest of which is Fira. There are plenty of places to stay in Santorini to suit all budgets, BUT (did you notice the big but??). Hotel rooms book up fast in Santorini. It really does pay to plan some months ahead of time. Additionally, if you are flexible on when to visit Santorini, I'd suggest not even considering August. It's far too crowded and expensive. Fira is not only the biggest town in Santorini, it is also the island's capital. This cosmopolitan town is located along the western edge of the island, and is quite easy to access from any point on the island. It lies only 3.72 miles (6 km) from the Kamari airport, and 5.6 miles (9 km) from the Athinios port. Oia is located 7.45 miles (12 km) from Fira, and is considered the most beautiful of the Santorini villages. 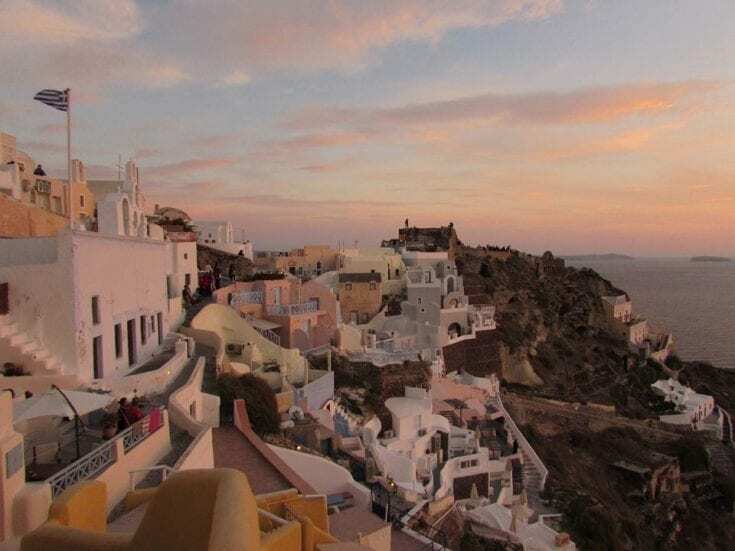 Many Santorini blog writers agree that Oia is the best spot for viewing what is considered the most famous sunset in the world. Because of its unprecedented beauty, Oia has been the site of many movie sets. The pink and ocher details on the churches, offset by the white and blue houses paint a portrait of village life that is too colorful to put into words. This idyllic village is quaint and peaceful during the day, but comes alive in the evening as tourists flock to catch a glimpse of the spectacular sunset. Note – Oia is VERY busy for the famous Santorini sunset, especially during the peak months of July and August. Flights to Santorini land at the island's airport which is located just 3.72 miles (6 km) from Fira, and 10.5 miles (17 km) from Oia. It has to be said that Santorini Airport is a bit small and crowded. Originally built as a regional airport, it struggles to keep up with the popularity Santorini has achieved as a bucket list destination from people all over the world. As such, I'd recommend organising transfers from the airport to be waiting for you on arrival. It's very easy to book Santorini transfers from the airport to your hotel online. The price is exactly the same as if you take one from the queue, but the added bonus is that your driver will be waiting for you in the arrivals area. Take a look at the link below to find out more about a pre-booked Santorini airport taxi. Although the island itself isn't very large, there are numerous ways to travel from point to point. One of the best (and most flexible) ways to tour Santorini is by car or motorbike. Other options include taxi and bus. Several companies located throughout Santorini offer car and motorbike rentals. Cars are available in both manual and automatic varieties, and can be rented by the day. Prices for these are reasonable, and fluctuate between low and high season. For more Santorini car hire information, use the link below. Santorini also has its own line of buses called a ‘KTEL', which travel to the main bus station located in Fira. This means that if you want to visit villages on opposite sides of the island, you would have to board a bus in one village, and then switch buses in Fira to travel to the other village. Costs for this service can vary depending on where you want to go. Bus tickets are purchased and issues from inside the bus itself. If you want to travel by car, and not have to drive it yourself, then you can utilize the island's taxi service. The main taxi company is located beside the KTEL terminal in Fira. The taxis travel to any point on the island, and are just a phone call away. Unlike the daily car rentals, the taxis charge per mile. In the winter (from December to mid-March), the temperature in Santorini is fairly mild, with occasional bouts of foul weather that includes rain and high winds. The average winter temperature hovers near or slightly below 50 degrees Fahrenheit (10 degrees Celcius). The chance of rainfall during the winter is generally higher than in the summer/spring months. Springtime is from mid-March to the end of May, and has a more stable, mild weather front than the winter. Rainfall is less frequent, and the temperatures can range from 50 degrees Fahrenheit (10 degrees Celcius) to 72 degrees Fahrenheit (16 degrees Celcius). The Summer months from June to mid-September can become quite arid, as the rainfall is rare during these months. Although the temperatures can soar, the winds blowing in from the North makes it bearable. Temperatures can range from 66 degrees Fahrenheit (19 degrees Celcius) to 85 degrees Fahrenheit (29 degrees Celcius). Autumn, which ranges from mid-September to November in Santorini can fluctuate as far as weather goes, as the days may be mostly warm and sunny, but rains can move in an stay for days at a time. The temperatures during this time can range from 66 degrees Fahrenheit (19 degrees Celcius) to 55 degrees Fahrenheit (19 degrees Celcius). The beaches along the Santorini coast are comprised mainly of a dark, volcanic sand, giving them quite a different appearance than your typical sandy beach. In my opinion, Santorini doesn't have great beaches, and beach lovers should instead think about the Greek island of Milos. If you're looking for a ‘touristy' spot, Kamari Beach is at the top of the list. There are many restaurants offering local food and drink, and the whole area has a very upbeat feel. Perissa Beach is popular among the backpacker crowd, and is a bit more quiet than Kamari, especially as you travel southward. There are numerous restaurants here as well. The aptly-named Red Beach is a popular destination because of its red-hued sand. This beach is only a 20-minute drive south of Fira, and is a stunning visual as the red sand offsets against the blue seas and sky. Be careful traveling by foot here, as the descent from the mainland to the actual beach can be a bit steep. 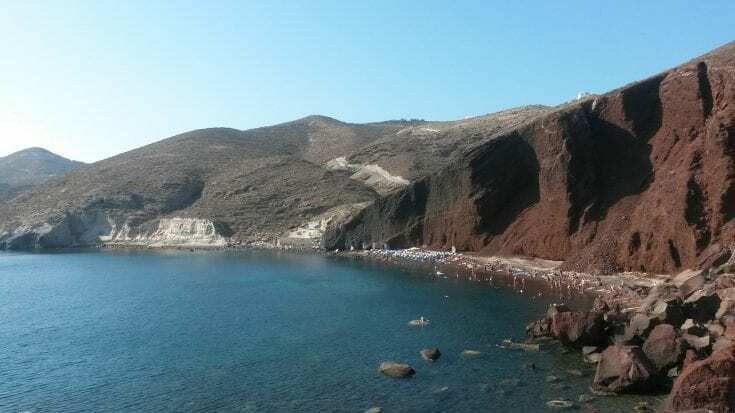 I've written a Santorini travel blog post just about Red Beach which you can find through the links at the top of the page. Monolithos is a more family-oriented beach, and has sand that most tourists are used to seeing. This beach has a very small selection of restaurants and hotels. This is the most quiet beach on our list, and is recommended for families with small children as there is a sandy play area, and the descent into the sea is sloped rather than a steep drop off like most of the other beaches.